The fire drill pierces the quiet conversation I was having during my planning period. I can’t help but roll my eyes. It’s March, so I’m in noticing mode. The street is wet with rain. We walk down and around to our drill area. Someone talks again, and is yelled at. I notice I think of my own kids, my home kids. I notice I am a softy, never wanting kids to feel the sting of being yelled at. I remind myself that I have yelled almost the same words to kids during fire drills before. After all, it’s a fire drill! These drills are meant to keep us safe. The kids have to take them seriously. This is a non negotiable. I notice I am still thinking of my own kids, my home kids. The way their faces would fall if they got yelled at in front of 800 kids. I know that sometimes kids should know the rules but don’t. I know that sometimes kids know the rules but don’t follow the rules. I know that it’s our job to remind them of the rules. “What kind of slice are you going to do?” One asks and my heart does a little teacher-slicer-dance. I can’t hear the answer, but I’m glad I didn’t yell at them for talking. 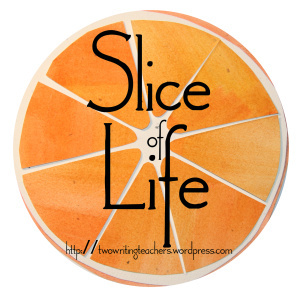 Yes, our “slicer-feelers” are out – I love that term! I feel like I need to draw a picture of this person with antennae coming out! I have been tense this week due to our testing and the kids being out of routine and regular structure. I got upset with a student and I always feel so bad afterward. So, you are not alone! Happy writing! slicer feelers! I love that! Somehow the mom (or parent) part of us adds to the teacher part of us. I suppose anytime we bring our whole self to school, whether we’re parents or teammates, or writers, we make our teacher selves a little richer. Just like when we recognize the whole child our time with them is richer. This is so true — Although my time management became more of a struggle as soon as I became a mom… I truly believe my parenting-self has only made me a richer teacher.